Long time no see! A lot has happened since we last spoke, but I won't bore you with personal yada yada. Let's talk about food, baby! There aren't any chocolate chips in my chorizo. Sorry, I just said that to lure you here. This post is an ode to chocolate chips and chorizo, though they are never featured in the same dish. Should we get started? 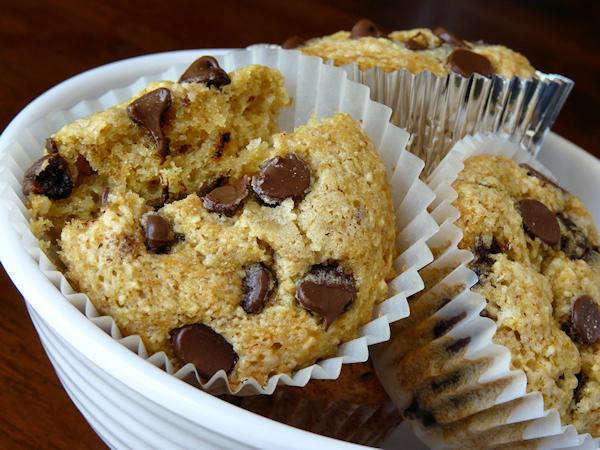 These are Sal's Banana, Peanut Butter, and Chocolate Chip Muffins. Do make them asap! That's a winning triple-threat right there. Elvis would most definitely approve. Sal made a fancy pants chocolatey drizzle for these, but I was too lazy. I made them with whole wheat pastry flour, but not because I'm too good for all purpose flour, I just didn't have any at the time. They are excellent with a nice cup of hot chocolate. 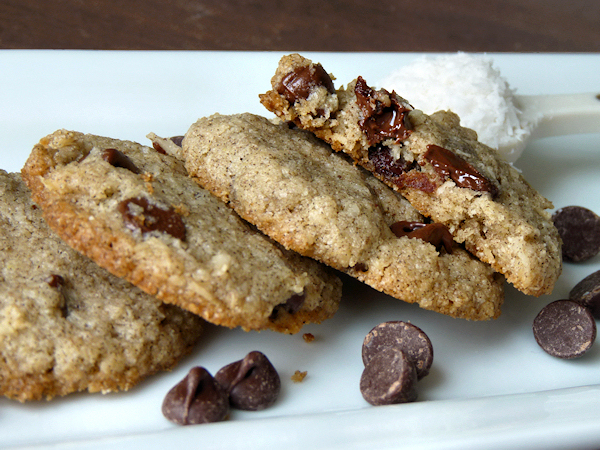 Jessy's Gluten-Free Coconut Chocolate Chip Cookies are melt-in-your-mouth delicious. Good luck eating only one or two of these addictive little cookies though. It can't be done! I made my own brown rice flour using my Blendtec because I'm cool like that. Jessy said that they are fantastical with a scoop of vanilla coconut ice cream on top, and she didn't lie! This wasn't the first time I made Andrea's Orange Chocolate Chip Cake. I blogged about it during Vegan MoFo 2010, and I still feel the same way about cranberries so I left them out again. The cake is made with a combination of white whole wheat flour, almond flour, and coconut flour, which gives the cake a terrific texture. 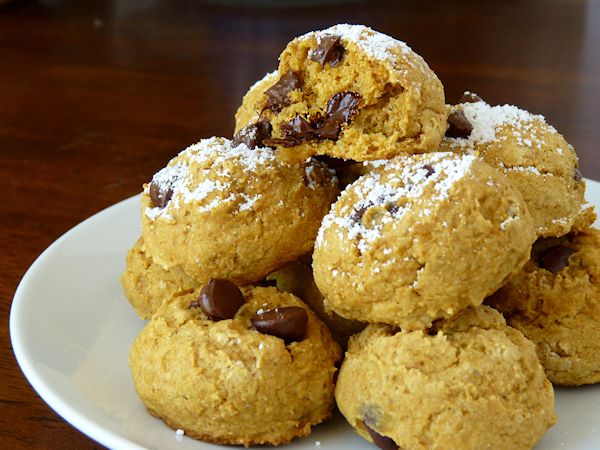 It's deliciously flavored with ginger, cinnamon, and orange, and the chocolate chips give it an extra dose of awesome! Too lazy to make a glaze, I just sprinkled a bit of sugar on top of the raw cupcakes. Mandee's Gluten-Free Chorizo is amazing! Mandee came up with a gluten-free chorizo recipe by doing a mash-up of a gluten-free sausage recipe + the chorizo recipe from Viva Vegan. The results were brilliant. Of course, it's not as chewy as gluten based faux meats, but the sausage has a firm, pleasant texture and it smells and tastes very much like chorizo. 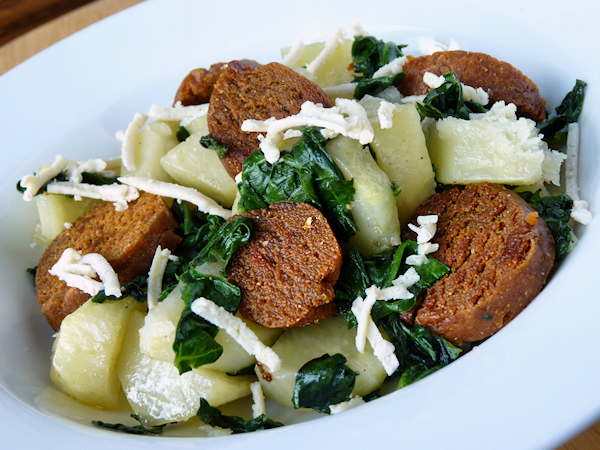 The first time I made it I had it sautéed with some steamed potatoes, wilted baby spinach, and a sprinkling of Daiya. Alisa's Cauliflower Risotto is fantastic! 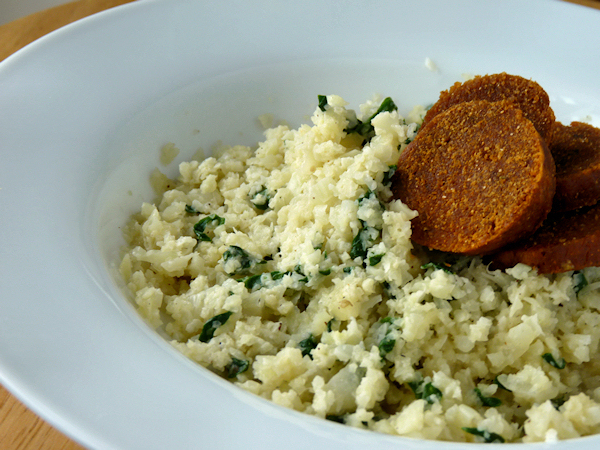 I love cauliflower "rice", and the creaminess of this "risotto" was a lovely change for me, because I had only ever had dry and crumbly cauli-rice. I used olive oil for mine, in case you're wondering. I also made a batch with steamed broccoli, but the pictures came out incredibly horrid. That is indeed more sautéed chorizo sitting pretty on top of the risotto, thank you for asking. Jes' Southern-Style Chorizo Soup looks a little different than the original here, because instead of using Trader Joe's soy chorizo I used Mandee's. 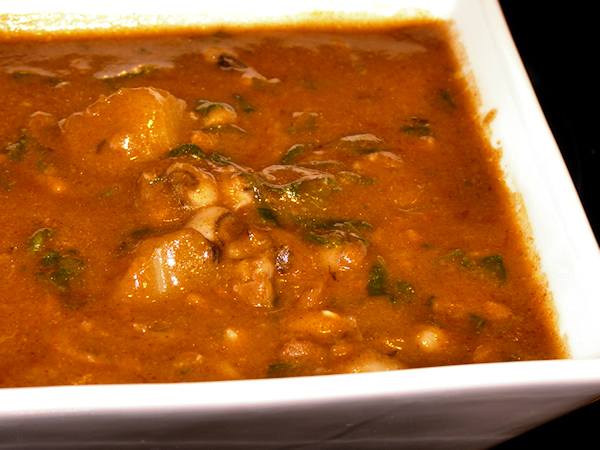 The soup is hearty and comforting, and the chorizo adds a wonderful flavor. I chopped the gluten-free chorizo before adding it to the soup, and the flours from the sausage thickened the soup a bit and made it more like a stew. I did have to add a couple of teaspoons of paprika to the soup because my chorizo wasn't as pigmented as Joe's is. 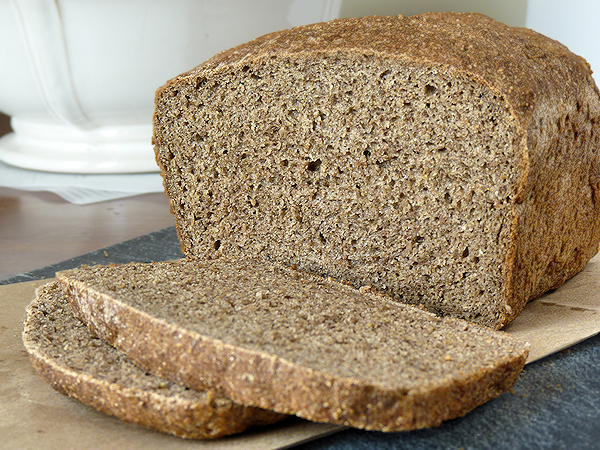 Mihl's Dark Wholemeal Bread with Flax Seeds has neither chocolate chips nor chorizo. It is however a beautiful, wholesome, delicious loaf of bread. I'm pretty sure that I didn't make my dough moist enough, but that's OK, that only means that I get to make it again in the near future. This bread is absolutely perfect with some jam and a good cup of coffee, or fauxfee. So there you have it, a round-up of awesome recipes that I have bookmarked while I quietly and creepily stalk other bloggers from the comfort of my hermit cave. It's nice to let other people be in charge of what we cook every now and then, isn't it? Ah! So good to see a post from you again, I've missed them! River! You are back! Plus, I am very relieved there are no chocolate chips in your chorizo. I adore both - but maybe after another? Hi Mihl! Chocolate chips in chorizo would be pretty weird, wouldn't it? I started another batch of your Dark Wholemeal Bread so I can have it for breakfast tomorrow. Yummy! Welcome back to blog-land. (A place I also only stalk now). Lovely to see you and all of your yummy treaties! Thank you, Mr. Amber Shea Fabulous Cookbook Author!! I intend to do a big review post of Practically Raw next time I come out of my hermit cave. And by Mr. I meant Ms. See, awkward stuff like this is why I should stay away from the interwebs! That IS a winning triple threat! YUM! and the chorizo looks fabulous and hearty! thanks for sharing! You're welcome, and thank you for stopping by! Chocolate and peanut butter together are always good, but banana takes them to a whole new level of awesome! And that chorizo is so tasty it's going to be a regular menu item for me now. River! squeeeeeeeeeeeeeeeeeee! hiya and hello, friend! not only was i crazy excited to see your post, but i was most happyfaced you tried the coconut chocolate chip cookies... you are too awesome! i've been meaning to make Mandee's gluten-free chorizo for a while now, i just keep forgetting. it's going to happen this weekend. it will! i must! totally going to try Jes' soup and i shall make a loaf of Mihl's dark bread for dan. you've got so much deliciousness going on - what a post! Hi Jessy! I loved the coconut chocolate chip cookies! 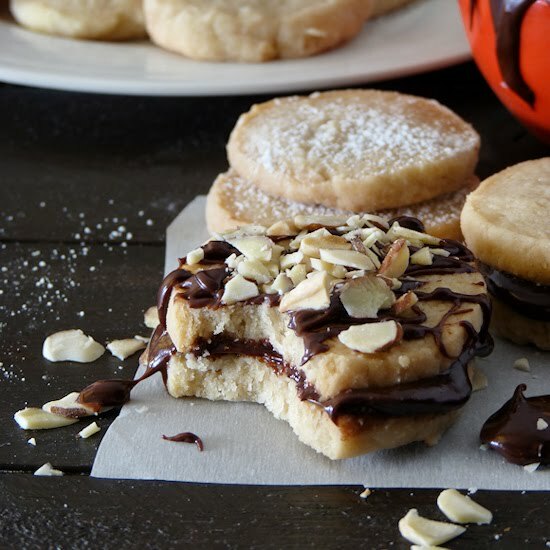 Your gluten free peanut butter cookies are next on my list. Yes! You must make the chorizo! Now I'm kicking myself for not trying it on pizza, and I'm going to have to wait until the next time we go home to take a few days off. I hope you guys enjoy it as much as I did! And the soup! And the bread! Oh how I've missed your posts - and to see one of my recipes here, a double bonus! Please emerge from the cave more often! River! Oh so wonderful to have you back! And now I have a million (well, ten or whatever) new recipes that I must make stat! Totally forgot about Jessy's chocolate chip cookies--now I've got a super craving. And thanks for the shout-out on the chorizo soup--I really want to try it with the gluten-free sausages, looks incredible! Hi Jes! Thank you! I am not *quite* back, but it's nice to peek outside my cave for a while. Definitely make the chorizo! I need to make some more next time we go home, and I want to make a double batch to see how well it freezes. It's nice to have it handy to spice up a boring dish (like my potatoes with spinach). Wow, that's quite a round up! I've been poking my head out occasionally, too. I'm back to the "Oh, someone commented, yay!" phase. Two comments and a phone mention from my mom and I feel like a rock star! So glad to see you back in action. when I step away from my blog and then come back, I wonder why I left in the first place. I forgot to ask, have you tried the Daiya wedges/blocks?? They are to die for. The new one we have tried on our veggie burgers is the Havarti with garlic and jalapeno. Just awesomeness at its best!! It's nice to "see" you too! I've been eyeing the Havarti wedges for a couple of weeks, and as soon as they go on sale I'm going to have to get me some. Or maybe I'll just buy them at full price! I'll definitely melt them on veggie burgers-thanks for the tip! RIVERRRRRRRRRRRRRRRRRRRR! Hello, hello, HELLO lovely! Long time no see for me as well, seems like June (or July 1) is the time to return to blogging, amirite? Blogging can be such fun, but sometimes it's nice to take a break and sort of step back and look at blogging from a different perspective. 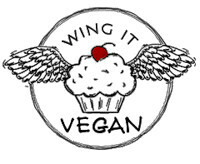 I think I know what I want to do with Wing-It now, if only I could just stick with it and blog more regularly! You're back!! Yay! Hope to hear from you some more. Thanks for the recipes. Definitely will be making some of them. Yum! I hope you enjoy the recipes as much as I did! We're going home for the weekend, so I will probably make another batch of Sal's muffins. I've been daydreaming about them for days! So yummy! Thanks River! I just might take you up on that! 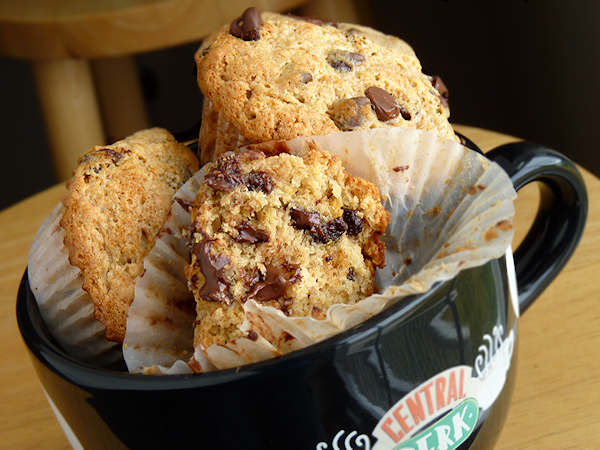 you have just really, really made me crave baked goods containing melty chocolate chips. must do some baking soon! You have been missed! Don't stay gone so long next time. (I'm very infrequent myself, though, as I've noticed is true for a lot of people these days.) I keep meaning to do a post like this with my experiences with others' recipes. Are you back?!? For good?!? Or are you just teasing us with delicious treats and adorable ducks?!! ?